The bag o lope was one of the first projects I created at the first Stampin Up party I attended over 12 years ago. The bag o lope is created using a sealed envelope and scoring the sides . 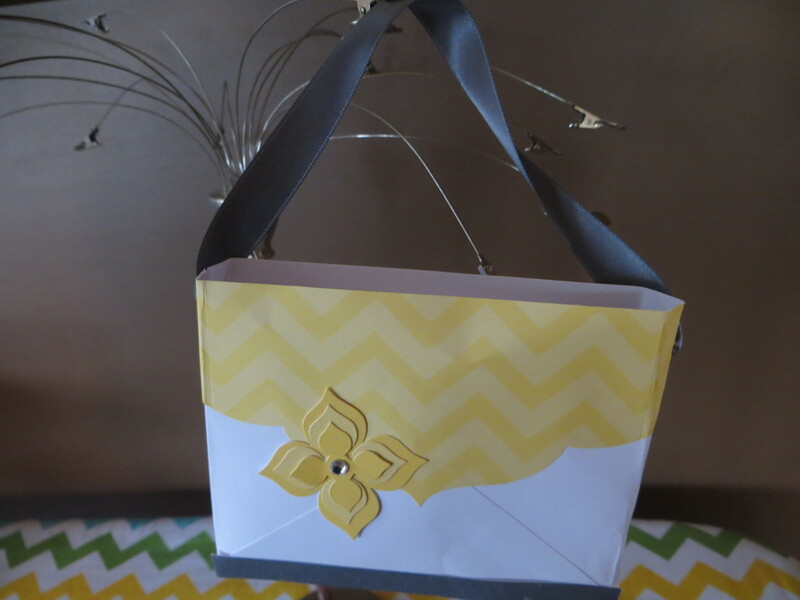 My project today uses the envelope from the Happy Hello Simply Sent Kit #130149. I embelliished with the flower stickers and added the Basic Gray satin ribbon handle. The Happy Hello Simply Sent kit is one of the many free items available in the annual Stampin Up Sale-A-Bration campaign running through March 22. For every $50spent you can choose a free item from the catalog. The Simply Sent Kits are designed to make card making a snap and include 8 diecut cards and super cute coordinating diecut envelopes and embellishments to make 8 cards. Happy birthday to my niece, Alexandra who is celebrating her 18th birthday today! Today’s post is another one of the cards that I made for my spoiled friend’s birthweek celebration in December and am just getting around to posting it. 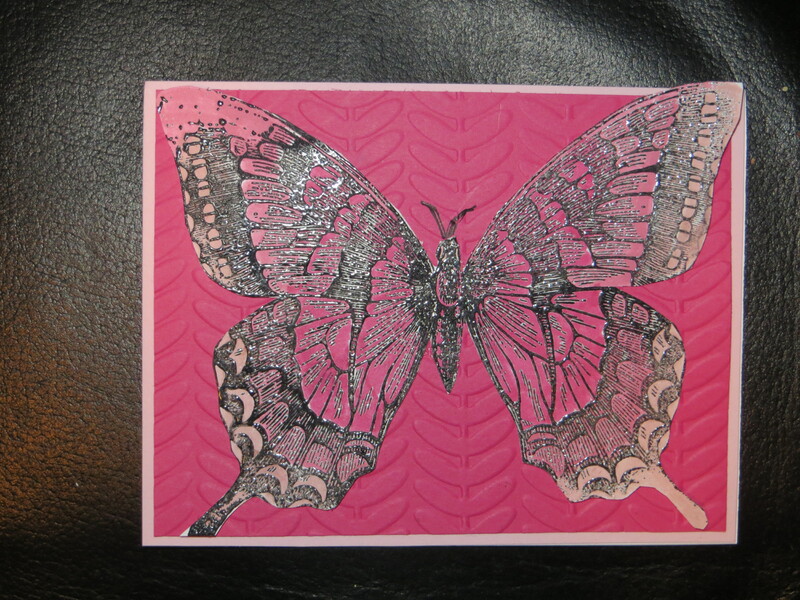 This card has a border of hand cut Papillion Potpourri butterflies stamp set #123759. 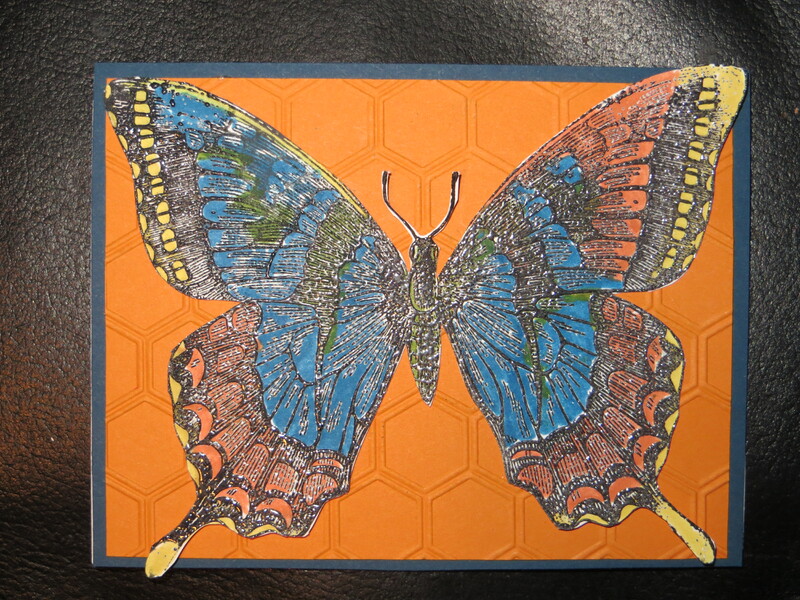 Each butterfly was embossed and then colored with In Color markers. The expression is from the Seasonal Saying stampset that is no longer available. 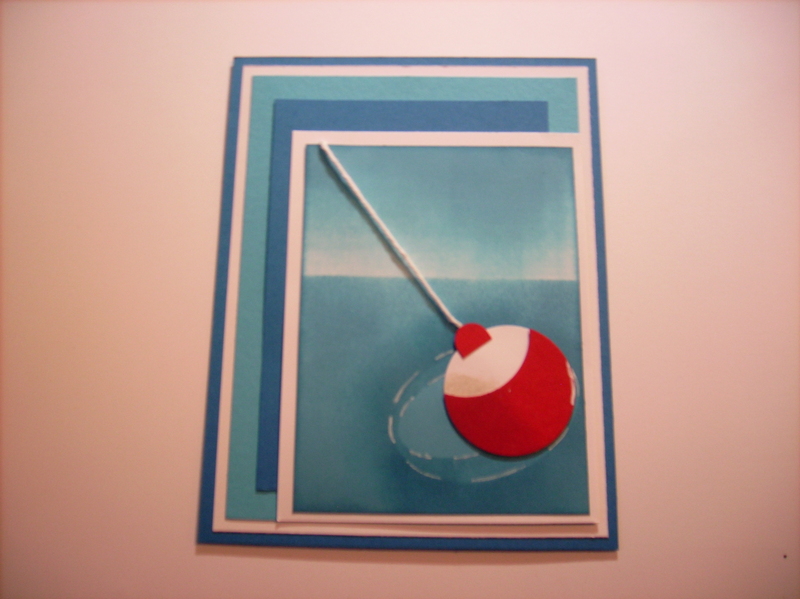 Today’s card is a wonderful masculine brayer card that Cammie created for our brother in law, David’s birthday. All these brayer cards that Cammie has made lately just want me to dust off my brayer and creating. The card is a simple design with multiple layers which works perfect for this card. The bobber is made using a circle and the word window punches. I love the ripple effect that Cammie created in the water with an oval mask and a white gel pen. Happy Birthday David-we hope you get a chance to go fishing. Well its the 25th of the month and that means it is time to post another Christmas card. Sorry for the blurry photo but I still think you may like the card. The background is a piece of DSP from the festive fun paper pack (no longer available) I used the cherry cobbler Coredinations cardstock and embossed it with the vintage wallpaper texture folder #120175. 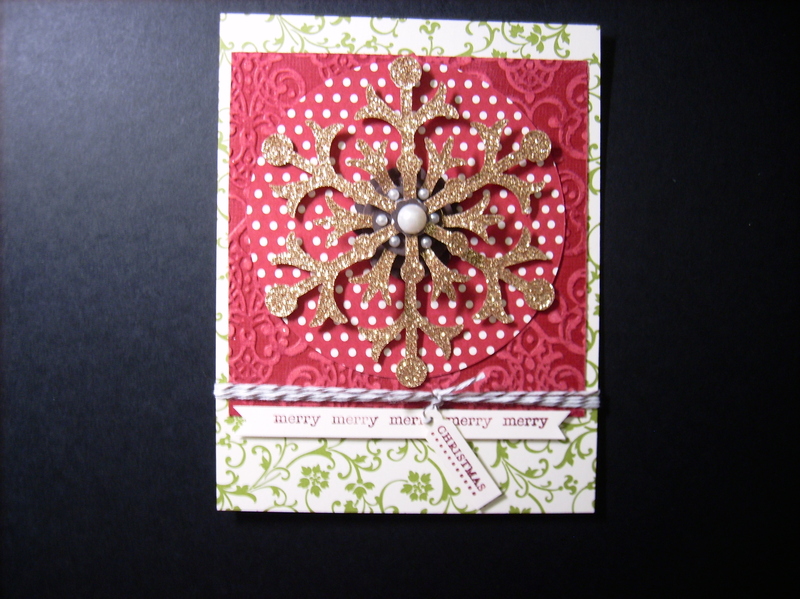 I cut a circle from a piece of DSP and added the Snowflake cut from the bronze glimmer paper using the Snow Flurry die #127813. The center of the snowflake is adorned with pearls. I finished the card by wrapping it with cherry cobbler bakers twine and a tag. Today’s card is a really sweet card. 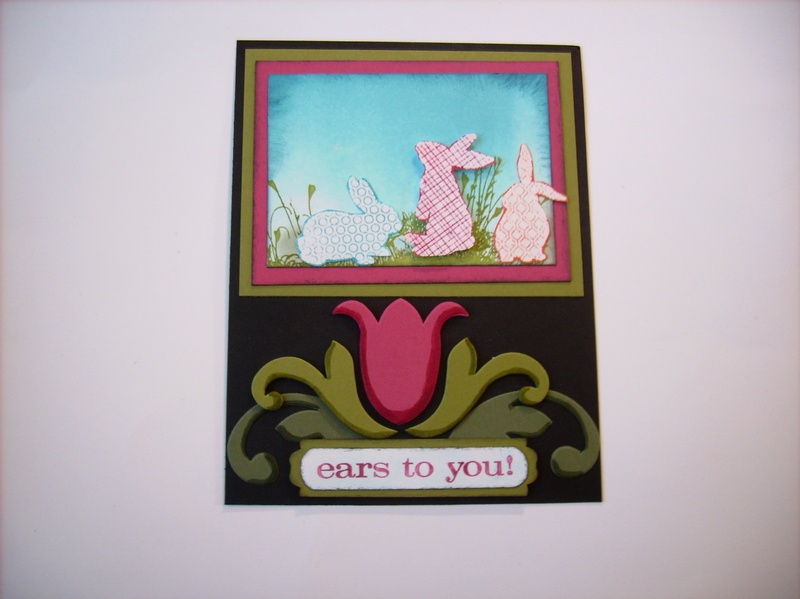 Cammie took advantage of the sentsational single stamp offer from Stampin Up and bought the Ears to You #132659 single stamp to make her 2013 Easter cards. The sky background is brayered and then she stamped the grass image. She stamped the Ears to You stamp 3 times in 3 different colors and then cut out one rabbit in each color and placed them in the grass. The tulip is a die that is now retired but looks fabulous on the dark black background. I love the way this card turned out and can’t wait to see the card when I receive it in the mail. Hurry- The single stamps are only available through March 31 so be sure to place your Stampin Up order. Plus if you order before March 22 you can take advantage of the fantastic Sale-A-Bration. Free Stampin Up item for every $50 spent. Happy birthday to my good friend Belinda. 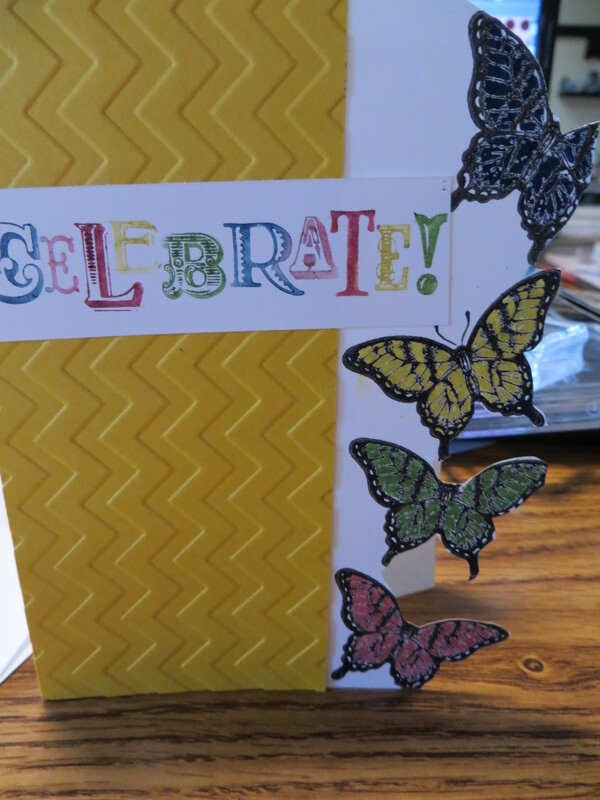 We have been friends since the 5th grade and today’s post is the card I made for her using the embossed Swallowtail butterfly stamp #129216 from the Stampin Up spring catalog. 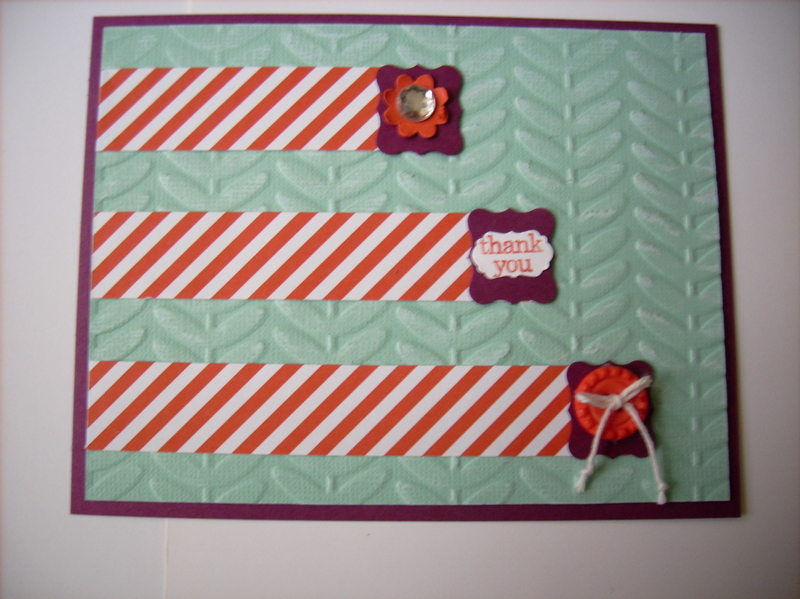 I used Stampin Up markers to color in the various shades of pink. I loved how it turned out that I made it 2 more times in other colors. Hopefully these beautiful butterflies will bring springtime soon. Today’s colorful card is one of Cammies favorite color combinations: Rich Razzleberry, Tangerine Tango, and Pool Party. Again today, Cammie wanted to feature products from the Stampin Up Sale-A-Bration. From now through March 22, 2013 Stampin Up has it’s annual Sale-A-Bration. Sale-A-Bration is the perfect time to stock up on your basic needs and items from your wishlist. For every $50 in product sales you will earn 1 item from the Sale-A-Bration catalog for FREE. This years Sale- A- Bration features 13 all new items plus 6 items from the Stampin Up annual catalog. Plus during Sale-A-BRation, for an order of $150 your will get 3 items free plus a pack of Silver Glimmer paper for a free bonus and of course the $25 in Hostess dollars to spend as you wish. Host a party with your friends and combine orders to make the most of the Hostess dollars and Sale-A-Bration free goods. Everything on this card is free (except the cardstock).The card base is Rich Razzleberry and then layered with Pool Party embossed with the Vine Street embossing folder #130492. Cammie cut 3 each 1″ strips in varying lengths from the Sycamore Street DSP #127540. At the end of each DSP strip, Cammie added a Razzleberry Petite Curly Label #129405. Each label is embellished using either the pretty petites stampset #129639 or buttons from the Sycamore Street Ribbon and Button bundle #130812.